Darragh Leader, James Connolly and James Mitchell all come into the side for Saturday’s Pool 5 encounter. Darragh Leader is set to start for Connacht this weekend. CONNACHT HAVE MADE three changes for this weekend’s European Challenge Cup clash with Brive. Darragh Leader, James Connolly and James Mitchell all come into the side for Saturday’s Pool 5 encounter, which kicks off at 3pm in The Sportsground. Connacht beat Brive away last weekend, securing a 38-31 bonus point victory, and Head Coach Kieran Keane has retained 12 of the players who started that game. Speaking ahead of the upcoming fixture, Backs Coach Nigel Carolan said: “We are hoping to use the win over Brive last weekend to kick us off to another good run of form. We have some big games coming up and maintaining a level of consistency is what we are aiming to achieve. Email “Connacht make 3 changes for home clash with Brive”. 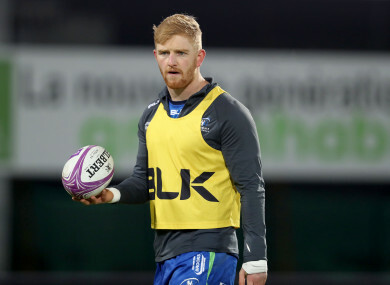 Feedback on “Connacht make 3 changes for home clash with Brive”.